5.4 Earthquake hits the northern Mid-Atlantic ridge. 5.2 Earthquake hits the western Indian-Antarctic ridge. Malta – A rare “Medicane” – a hybrid storm with characteristics of both a tropical storm and an extratropical storm – formed over the South Central Mediterranean Sea on Friday and moved over the island of Malta, bringing it tropical storm-like conditions. Winds at the Luqa, Malta Airport looked suspiciously like what one would observe with a tropical storm passing overhead – a double peak with a near-calm in between, with the pressure falling to 984 mb during the calm. Winds peaked in Malta at 47 mph, gusting to 66 mph, at 6:37 pm local time, and the island was lashed with flooding rains. At least one funnel cloud was also observed. Italy – Much of Italy remained on maximum weather alert on Friday as the wave of storms and torrential rain that has caused huge disruption and floods in many areas continued. Schools in Rome reopened as the level of alert there was lowered from red to orange, but students in other parts of the country, including the city of Frosinone near the capital and Catania in Sicily, had the day off as a precaution with storms forecast to arrive. Disruption also continued in Rome, despite the lowering of the alert, with floods causing one metro station to close on Friday, after four were temporarily shut on Thursday, and a woman passer-by was hurt when a tree fell amid torrential rain. The bad weather also contributed to major traffic congestion in the city. The bad weather system, which hit northern Italy first this week, causing massive damage and flooding in the Tuscan city of Carrara, has extended southwards. Strong winds and rain lashed Calabria and Puglia, while sea connections between Naples and the islands of Capri were suspended. Alaska – A massive storm in the Bering Sea, off the western Alaska coast and to the east of Russia, strengthened enough to be considered the strongest storm that the turbulent region has ever seen. It may not be an official record, however, as the minimum central pressure of 924 millibars (mb) was estimated by meteorologists, since the storm is over the open ocean off the Kamchatka Peninsula. The hole in stratospheric ozone over Antarctica has remained stubbornly large in recent years despite a worldwide ban since 1987 on the chlorine emissions that created it, according to NASA. While this year’s maximum expanse of the ozone hole, reached on Sept. 9, was about 9 percent less than the record set in 2000, its coverage was about the same as in 2010, 2012 and 2013. Earth’s ozone layer helps shield life on the surface from potentially harmful ultraviolet radiation that can cause skin cancer, cataracts and plant damage. The reason the hole isn’t closing up despite no new chlorofluorocarbons being released into the atmosphere is clouded by a complex interaction between it and climate change, scientists say. 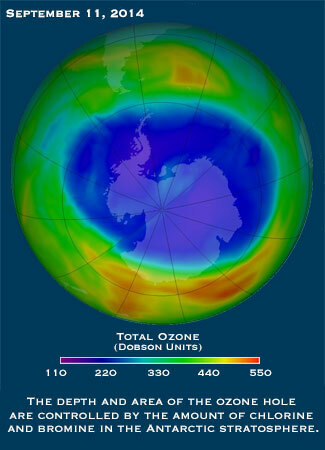 “The ozone hole itself is affecting the climate of Antarctica and Australia, and is being affected by it. It is changing the wind systems,” said Jonathan Shanklin of the British Antarctic Survey, one of the three scientists who discovered the hole in the 1980s. He tells The Guardian he expects the ozone hole to gradually fill in even as the effects of climate change increase over the next 50 years or so. The U.N. Environment Program and the World Meteorological Organization announced last month that while there were “positive indications” that the ozone layer is recovering, it could take another 35 years to get back to 1980s levels. The ozone hole over Antarctica two days after it reached its greatest size this year. Sao Paulo is suffering the worst drought to hit southeastern Brazil in more than eight decades. Brazil’s biggest city is desperate for water as a severe drought causes problems for more than 10 million people in southeast Brazil.